Be the first to share your favorite memory, photo or story of Thaddeus. This memorial page is dedicated for family, friends and future generations to celebrate the life of their loved one. Thaddeus E. Korabik was born February 4, 1927 in Chicago to Valentine and Anna (nee Rapacz) Korabik. 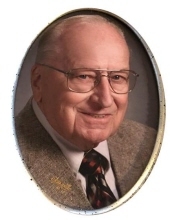 He died January 24, 2019 at JourneyCare Hospice in Barrington. Thaddeus was a proud US Navy Veteran. He worked as a Tax Accountant for Northern Illinois Gas Company. Thaddeus was a very active member of St James. He served in the Knight of Columbus, Former Secretary of the St. James Holy Name Society, Former member of St. James Ushers Club. He also served as the First President of Archbishop Joseph Weber High School Parents Club and was a member of the Chicago Tax Club. Thaddeus is survived by his children Karen Korabik, Robert (Betty) Korabik, Debbie Korabik-Agnew, Joseph (Cheryl) Korabik and Gerard (Stefanie) Korabik; his grandchildren Steve (Corey), Michelle (Greg), Michael (Julianne), Robert (Valya), Patrick, Hilary, Thomas, Christopher, Angela, Alyssa, Andrew, Ryan, Alec and Evan and by his great grandchildren Dylan, Zachary, Kinzey and Evie. Thaddeus is preceded in death by his wife Clara (nee Klimek) Korabik; his daughter Katherine (Steve) Grempka; his siblings Fr. Joseph Korabik, C.R. and Louise (late Edward) Chalupnik. Visitation Tuesday, January 29, 2019 from 3:00 PM until 8:00 PM at the Glueckert Funeral Home, Ltd., 1520 N. Arlington Heights Road, (4 blocks south of Palatine Road) Arlington Heights and Wednesday, January 30, 2019 at St. Edna Catholic Church, 2525 N. Arlington Heights Road, Arlington Heights from 9:00 AM until the time of mass at 10:00 AM. Interment Maryhill Cemetery. In lieu of flowers, memorial contributions may be given to masses in Thaddeus’s name. "Email Address" would like to share the life celebration of Thaddeus E. Korabik. Click on the "link" to go to share a favorite memory or leave a condolence message for the family.